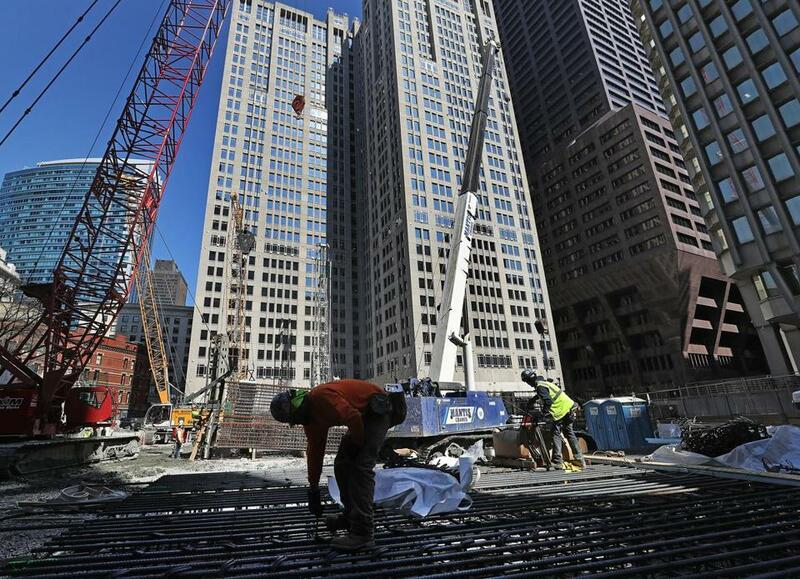 Foundation work is underway for Winthrop Center, the high-rise being built on the site of a now-demolished City of Boston parking garage near Winthrop Square. That’s what has happened to the street-level public passageway at the heart of a skyscraper under construction in the Financial District. The developer, Millennium Partners, has renamed the project, planned for the lobby of its Winthrop Center tower, and unveiled a new design for it that’s undergoing city review. It’s the latest iteration of the space, which Millennium pitched as a grand civic asset in 2016, when it won the hotly contested site of the old city-owned Winthrop Square Garage. The city asked developers interested in the parcel to include an observation deck in their plans. Instead, Millennium offered up the Great Hall, a 12,000-square-foot space with huge doors that would often be open, connecting Devonshire and Federal streets at the tower’s base. The company pledged that the hall would mean more to Boston than any observation deck ever could. 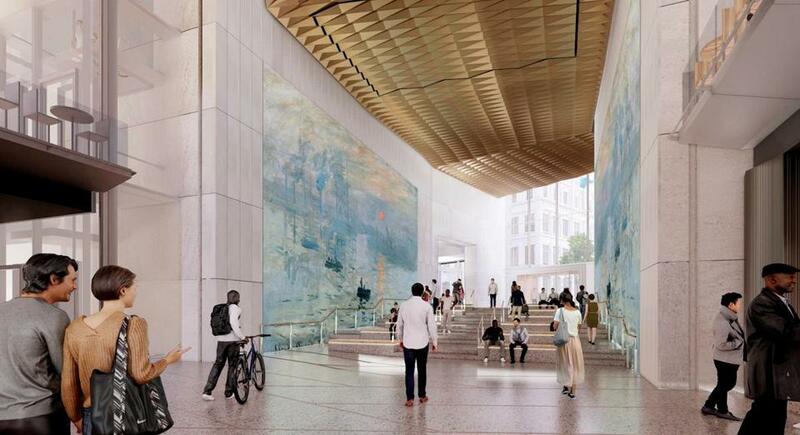 The latest renderings of the Winthrop Square Tower lobby are undergoing city review. As plans for the nearly 700-foot-tall building — which broke ground last fall and is scheduled to open in 2022 — have evolved, so too have plans for the hall. Gone are the soaring vaulted ceilings Millennium first showed. Also gone is some of the multistory space that appeared in versions of the project that initially moved through the design review process. The latest incarnation shows a long, clean, high-ceilinged lobby with furniture that can be easily moved for events, and massive digital boards that will display data from the building itself, and the neighborhood. Then there’s the name. After years of talking about its Great Hall, Millennium has dropped the label in favor of something more, well, descriptive — the Connector. In talks with people around the city, Great Hall just didn’t catch on, said a Millennium principal, Joe Larkin. They wanted something that would feel welcoming to all Bostonians. The design plan in 2016. And the mission, Millennium promises, remains the same: To build an accessible civic space that’s programmed for performances, lectures, and other public events that doubles as a lobby for the massive building, while offering an appealing pathway for people walking between South Station and Downtown Crossing. That civic use is part of Millennium’s deal with the city to build and permit the $1.3 billion tower. When the Boston Planning & Development Agency approved Winthrop Center last year, it required the Great Hall “first and foremost to be a space for the public,” and that Millennium bear all operational costs. The developer has been tweaking the design ever since, with the latest version set to go back to the Boston Civic Design Commission Tuesday night. Once it’s approved, they’ll move on to mapping out a plan for programming and vendors there, said Jon Greeley, BPDA design review chief. Such privately operated civic spaces are increasingly common in buildings around Boston, from stand-alone facilities like District Hall in the Seaport to publicly accessible lobbies that dot downtown and the Back Bay. Building them is a way to carve out new indoor public spaces in a crowded city, though critics say they’re often not property publicized as such, making them feel less than open to all. 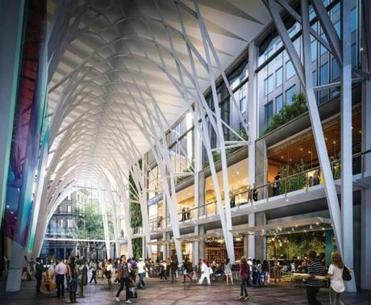 The BPDA, Greeley said, will keep a close eye on the Connector, which could serve as a model for public space in other big buildings. The agency aims to have a place that draws in all kinds of people, and, once open, will require ongoing review of how it’s working — or isn’t working. “We’re setting a really high bar for how this is going to be done,” he said. A growing number of big buildings are experimenting with fancy, more public lobbies, offering office workers and passersby a place to gather, buy a cup of coffee, or grab something to eat. They serve to bring foot traffic into a building, create a community gathering place, and perhaps even help fill office space upstairs. Such venues are popping up all over downtown, including the striking atrium that Boston Properties opened last year at 100 Federal St. at Post Office Square and the vast food hall Samuels & Associates is building for Time Out Market on the ground floor of Landmark Center in the Fenway. But Larkin and Blake Middleton, the lead architect for Winthrop Center, say Millennium’s ambitions are bigger. They envision a performance space, a pathway through downtown, and something that resembles a public living room, and they’re budgeting to fund it. Whatever it ultimately looks like.